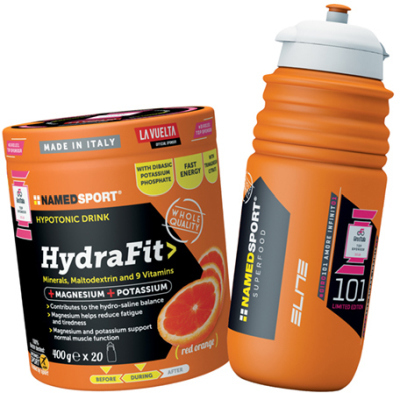 HydraFit> is an exclusive blend of mineral salts, maltodextrin and vitamins that has been specially created into a hypotonic electrolyte drink. (Osmolarity 190 mOsm/l). HydraFit> is the ideal solution for replacing the mineral salts lost by the body due to excessive sweating during intense exercise. Magnesium and potassium proper muscle functions and reduce the effects of fatigue. Dextrose, maltodextrin 25%, acidity regulator: citric acid; Trisodium citrate, aroma: red orange; beet juice powder, trimagnesium citrate 1.56%, dibasic calcium phosphate, sodium chloride, dibasic potassium phosphate 1.08%, anti-caking agent: silicon dioxide; vitamin C (L-ascorbic acid), sweetener: sucralose; niacin (nicotinamide); pantothenic acid (calcium D- pantothenate), vitamin B6 (pyridoxine hydrochloride), vitamin B2 (riboflavin), vitamin B1 (thiamine hydrochloride), folic acid (pteroyl-monoglutamic acid), biotin, vitamin B12 (cyanocobalamin). Warning: food supplements are not intended as a substitute for a varied and balanced diet and a healthy lifestyle. Do not exceed the daily intake of 60g (3 servings). Keep out of each of young children. Storage conditions: store in a cool, dry place. The best before date applies to the product if stored correctly in sealed packaging. Dispose in an environmental friendly way after use.